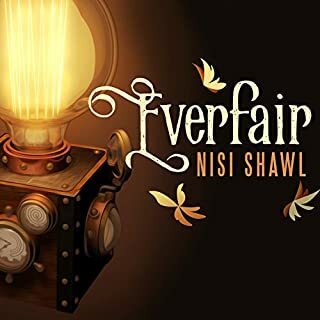 Everfair is a wonderful neo-Victorian alternate history novel that explores the question of what might have come of Belgium's disastrous colonization of the Congo if the native populations had learned about steam technology a bit earlier. Fabian Socialists from Great Britian join forces with African American missionaries to purchase land from the Belgian Congo's "owner", King Leopold II. This land, named Everfair, is set aside as a safe haven, an imaginary utopia for native populations of the Congo, as well as escaped slaves returning from America. 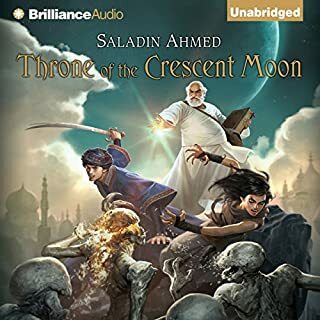 The Crescent Moon Kingdoms, home to djenn and ghuls, holy warriors and heretics, are at the boiling point of a power struggle between the iron-fisted Khalif and the mysterious master thief known as the Falcon Prince. In the midst of this brewing rebellion a series of brutal supernatural murders strikes at the heart of the Kingdoms. It is up to a handful of heroes to learn the truth behind these killings: Doctor Adoulla Makhslood, Raseed bas Raseed, Adoulla’s young assistant, and Zamia Badawi, Protector of the Band. When a murdered woman is found in the city of Beszel, somewhere at the edge of Europe, it looks to be a routine case for Inspector Tyador Borlof the Extreme Crime Squad. But as he investigates, the evidence points to conspiracies far stranger and more deadly than anything he could have imagined. Borl must travel from the decaying Beszel to the only metropolis on Earth as strange as his own. Enchanting Debut Novel - Delicious! When you listen to Lily and the Octopus, you will be taken on an unforgettable ride. The magic of this novel is in the listening, and we don't want to spoil it by giving away too many details. We can tell you that this is a story about that special someone: the one you trust, the one you can't live without. For Ted Flask, that someone special is his aging companion, Lily, who happens to be a dog. STOP. You should not have touched this flyer with your bare hands. NO, don't put it down. It's too late. They're watching you. My name is David Wong. My best friend is John. Those names are fake. You might want to change yours. You may not want to know about the things you'll read on these pages, about the sauce, about Korrok, about the invasion, and the future. But it's too late. You touched the book. You're in the game. You're under the eye. The only defense is knowledge. You need to read this book, to the end. Even the part with the bratwurst. Why? Vulgar Funny. 4.95 Sale Win. In Saturn's Children, Freya is an obsolete android concubine in a society where humans haven't existed for hundreds of years. A rigid caste system keeps the Aristos, a vindictive group of humanoids, well in control of the lower, slave-chipped classes. So when Freya offends one particularly nasty Aristo, she's forced to take a dangerous courier job off-planet. Everyone knew the legend of Christopher Sim. Fighter. Leader. An interstellar hero with a rare talent for war, Sim changed mankind's history forever when he forged a ragtag group of misfits into the weapon that broke the back of the alien Ashiyyur. But now, Alex Benedict has found a startling bit of information, long buried in an ancient computer file. If it is true, then Christopher Sim was a fraud. Outside any city still standing, the Mechanical Circus Tresaulti sets up its tents. Crowds pack the benches to gawk at the brass-and-copper troupe and their impossible feats: Ayar the Strong Man, the acrobatic Grimaldi Brothers, fearless Elena and her aerialists who perform on living trapezes. War is everywhere, but while the Circus is performing, the world is magic. That magic is no accident: Boss builds her circus from the bones out, molding a mechanical company that will survive the unforgiving landscape. But even a careful ringmaster can make mistakes. Two of Tresaulti's performers are entangled in a secret standoff that threatens to tear the circus apart just as the war lands on their doorstep. Now the Circus must fight a war on two fronts: one from the outside, and a more dangerous one from within. ©2011 Genevieve Valentine (P)2012 Audible, Inc. The story becomes compelling the longer you listen. This is one of those fantastic story lines where you simply suspend disbelief (really how could she possibly replace bone with copper tubes???) because you are simply drawn into the charaters' plight. The fact that the story manages to be compelling and horrific at the same time certainly helps keep you listening. If you could sum up Mechanique in three words, what would they be? My favorite character would have to be Stenos for his complexity and strangely broken angst filled nature. What about Scott Aiello’s performance did you like? What didn't I like! 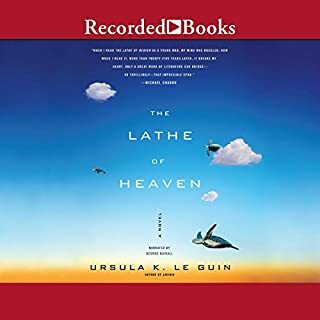 It is one of the real joys of Audiobooks to hear such a great reader not simply read the words of the book but actually embody each character in a different voice. With the constant shifting POV of Mechanique I think this enhanced the experience of the story itself. Mechanique is beautifully written and beautifully performed. 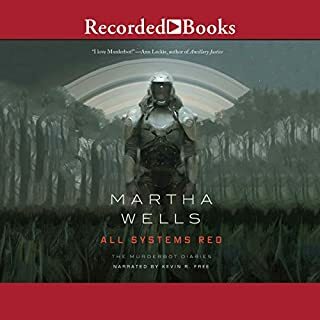 I keep mostly to ebooks and audiobooks nowadays but this is one I'll probably purchase a physical copy to read again, glad to have come to it through this excellent audio version first. This is a different sort of book. The characters are complex and loveable. The storyline is nonlinear. The setting is unusual and surreal. 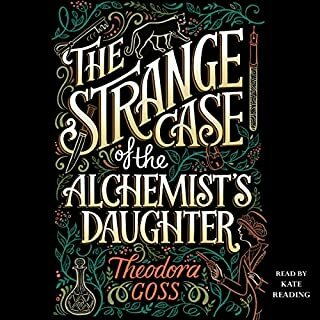 I enjoyed listening to this audiobook very much. I don't want to give anything away because it's such an unusual book. 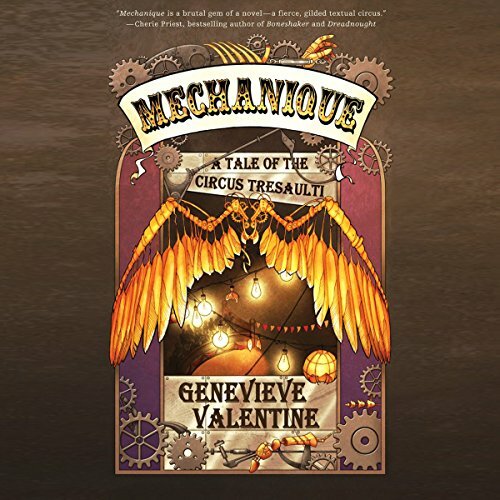 I've read LOTS of books and LOTS of genres, and if you love a good bedtime story you'll enjoy Mechanique. My only complaint is that it could have been longer - there is so much more I wanted to know! if I could only get a refund. What would have made Mechanique better? The story seemed flawed from the onset. Poor character development. Flash forwards and flash backs made an already disjointed story even worse. How this is supposed to be steampunk, I'm not really sure. It had a more supernatural/post apocolyptic twist to it then steam punk.At one point I forgot to turn off my audio player. I came back 15 minutes later and I was actually glad I didn't have to suffer another 15 minutes of that story. About 10 minutes later I decided to not suffer anymore of this horrible story. What was most disappointing about Genevieve Valentine’s story? The disjointedness of it didn't allow for any story flow. What didn’t you like about Scott Aiello’s performance? He did the best he could with what he had. Sorry if my review is poorly worded. I submitted it from my cellphone. 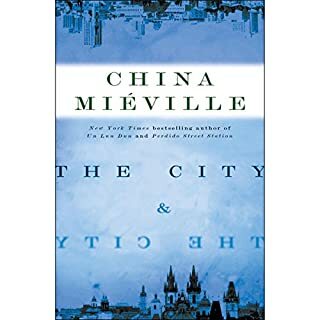 I really wanted to like this book after reading "Water for Elephants" which was also about a circus and a superb story which I enjoyed it immensely! However, "Mechanique" came across to me as a dark, disjointed story with the characters wandering around angry and waiting to 'do each other in'. I eventually had to stop listening as I got to frustrated and depressed with not knowing the characters and losing the plot as it was not clearly defined by the author. If you like dark depressing books, then this is for you. imagine River from TV's Firefly wants to tell you an 8 hour story...its about a steampunk circus and 4 hours in there is no plot, not so much as an emotional attachment to any character. I'm more than halfway through this book its discombobulated garbage, the narrator keeps jumping times, without so much as a paragraph break. I will admit, I only had any curiosity about this book because it seemed to come right on the heels of "The Night Circus", of whose summary it seemed extremely similar to. Coupled with the additional "steampunk" quality it boasted, I was initially convinced that this was nothing more than a cheap shot riding two very popular coat tails. That may or may not be true of this book, but I can say that the story itself was more unique and interesting than I expected. The narrator, unfortunately, was awful. I will never listen to anything Scott Aiello narrates again. If I were stumbling across this for the first time again, I'd buy the book, not the audio. If it had more flow to it, and if the characters were more developed. I am nuts about circus stuff, and I am interested by the steampunk genre, but this really didn't satisfy either for me. I only liked a couple of the characters and found the story very hard to focus on. I kept thinking I must have missed something and went back to listen, but I hadn't. I think some of the fault may be given to the book here, but it seemed that he was inconsistent in which voices he was using for which part, and to be honest, I wasn't quite sure why he used particular voices much of the time. I wouldn't avoid another book that I wanted to listen to if he narrated it, though. I would give him another chance. It had potential. It seemed unique and some of the characters were interesting. Maybe a more agressive editor could have helped the author collect this story into something better to read/listen to. The writing style of this book reminded me a little bit of the Dreamhunter Duet, in that the actual story is not apparent until the end. Each scene, in the story, is told and then retold from the view of the different characters. So, it took me a little while to catch the rhythm of the story to be able to follow along. Overall, I found the writing to be good. However, the story itself was too bleak and depressing for my taste. If the story wasn't such a bore. Would you ever listen to anything by Genevieve Valentine again? Scott Aiello is a good reader and all, but this story was just tedious to listen to.